“Death of William Ongley in Oil City, Pa.
As stated in yesterday’s Observer, William Ongley was found dead in bed at Oil City, Pa., yesterday morning. He was a resident of Utica, and left there only about six weeks ago. He was an artist, and was on tour to sell his pictures. His death will be learned with regret, not only by his friends in Utica, but throughout the State as he had an extensive acquaintance. Mr. Ongley was born in England, and was 58 years of age. He came to this country when very young, and spent his youthful days in Syracuse. 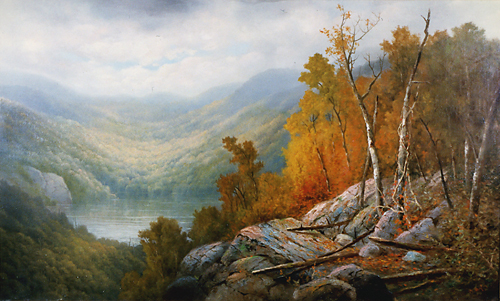 He became infatuated with art and went to New York where he worked for a time with artist Whiteridge (Whittredge). In 1871 he married Miss Mary Potter of Hartford, Conn., and for a number of years he traveled through the Eastern States painting pictures and selling them. 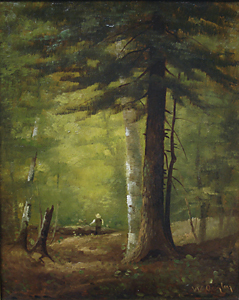 The Everson Museum of Art in Syracuse, NY and The Adirondack Museum in Blue Mountain Lake, NY both have landscapes of William Ongley in their Collections. His paintings turn up in Syracuse, Ithaca, Auburn and Geneva so he must have had patrons in and traveled through the Finger Lakes. 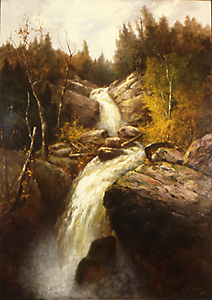 His paintings are usually mountain lake landscapes, waterfalls, glens, or deep woodland scenes. He has a great eye for nature and a real appreciation of light in the wilderness.